How has former Portsmouth target Mo Eisa fared at Bristol City? The January transfer window soon to open and it offers Kenny Jackett the opportunity to bolster Pompey’s League One promotion charge. The Blues boss is already plotting his recruitment, as he looks to strengthen his squad for the second half of the season. Jackett has revealed to The News that he’s looking to boost his forward options. A pacy striker is top of the manager’s shopping list, arguably the only missing link in his table-topping squad. Jackett fruitlessly chased one in particular during the summer – Mo Eisa. 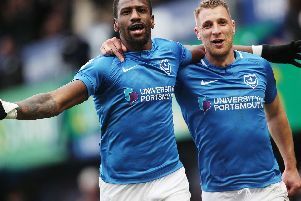 The Pompey boss was prepared splash the case on the Sudan international, after he netted 25 goals for Cheltenham in League Two last term. Eisa opted for a switch to the Championship, though, joining Bristol City for a reported fee of £1.5m. But things haven’t quite went to plan for the 24-year-old at the Robins this season. Eisa has featured only five times in all competitions and yet to score. In fairness, the former non-league ace has spent the majority of the campaign on the sidelines after suffering ankle ligament damage in August. But before his injury, he amassed just 12 Championship minutes from three substitute outings, as well as a start in City’s 1-0 Carabao Cup loss to Plymouth. Eisa was ruled out of first-team action for more than three months, making his return as a 78th-minute substitute in City’s 2-0 defeat to Leeds on Saturday. The marksman will now be looking to establish himself at Ashton Gate having regained full fitness. But based on the first half of the campaign, it seems like missing out on Eisa may have been a slight blessing in disguise for Pompey.